Summer is now in full swing, and we hope that our readers are getting out on the water and enjoying these warm sunny days. For a while it seemed like they would never get here, so enjoy. 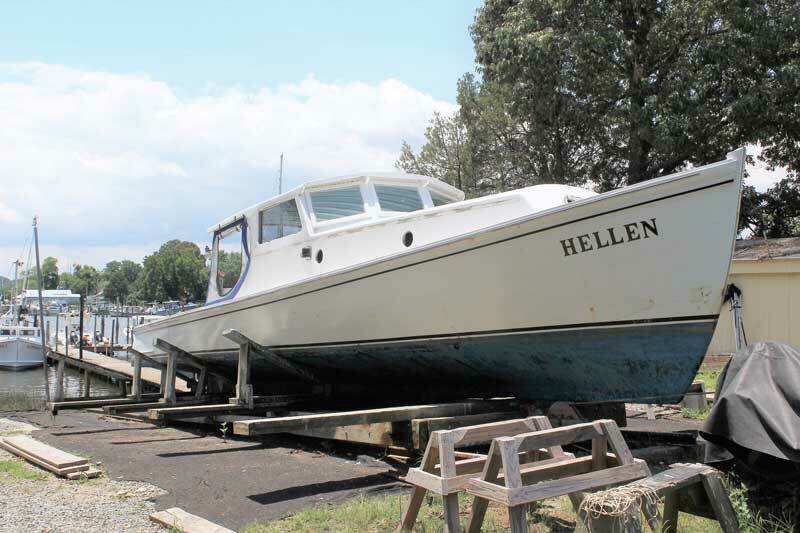 Area boatshops continue to hum with a great variety of projects. In the past we have reported on the building of a couple of log canoes. We must admit that we are fascinated by these uniquely Chesapeake boats. While most of us think of log canoes as sailing craft, they were actually everyday work boats, and as small marine engines became available around the turn of the last century, many were converted to power and many were built for engine power. In addition to the following report of plans to build another log canoe at the Chesapeake Bay Maritime Museum (CBMM) in St Michaels, MD, Bethany Ziegler has supplied a historic photograph of Alverta, a log canoe designed and built for engine power around 1908. In her distinctive profile you can see many design elements that carried over into the modern Bay-built deadrise. Pictured here on the Choptank River at Cambridge, MD, Alverta was donated to the Chesapeake Bay Maritime Museum by Douglas and Joyce N.B. Ferris. Gift of Mrs. Nellie Poet. CBMM has announced its latest shipyard project, the building of a new log hull canoe. Construction will begin this fall, with the project set to be finished next summer. This Tilghman Island style, five-log canoe will be built from the excess loblolly pine logs used in the historic restoration of Edna E. Lockwood. The hull is set to reach approximately 32 feet in length, with a beam width of six feet. The building process will kick off in September, with milling of the logs, and will continue with shaping the hull into early 2019. Once the major components of building the hull are complete, the boat will be moved to the corn crib, where the rest of construction will take place. “It’s exciting that we’re becoming more known. We’ve put a lot of effort into learning how to build log canoes, and I’m glad that’s being recognized and that other people are interested in our work,” said CBMM shipyard manager Mike Gorman. “Construction on the log canoe will be undertaken this year alongside another major project. Following the launch of Edna E. Lockwood at OysterFest in October, CBMM will start restoration on the 1912 river tug Delaware, a member of the floating fleet featured in the new “Lines of the Floating Fleet” exhibition. This is not the first log canoe to be built at CBMM. In April, 2015, the first log canoe built since 1979 named Bufflehead was launched. The shipwrights and apprentices constructed the hull of Bufflehead out of three, 26-foot loblolly pine logs. Each summer, CBMM staff set sail on this canoe along the Miles River, for the Chesapeake Bay Summer log canoe races. While Bufflehead resides on CBMM’s campus for the public to view, the new log canoe being built this year is a private commission." 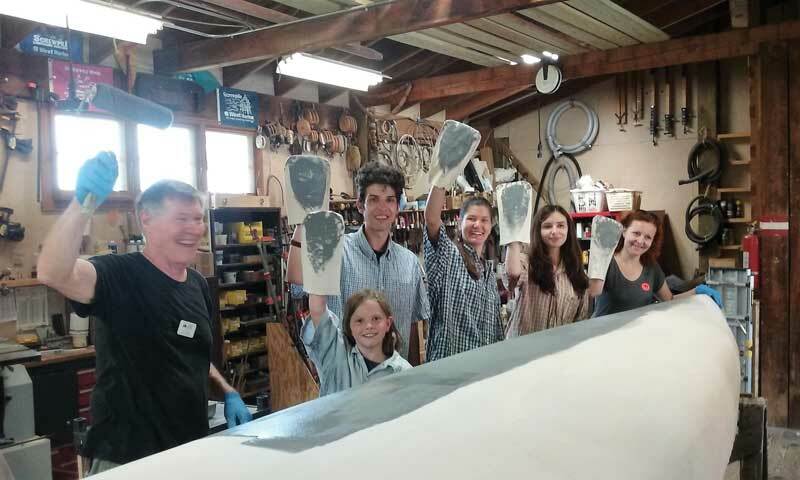 Tony Pettit, Patuxent Small Craft Guild volunteer, with visiting students from Bosnia in the shop at Solomons, MD. 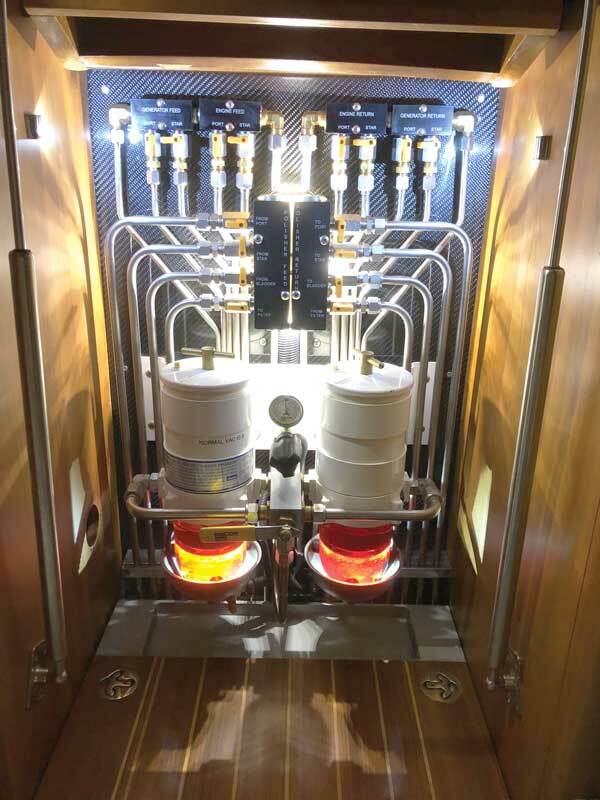 Jeff Leitch from Bay Shore Marine in Annapolis sent us some pictures of a custom-built fuel management system for Robin, a 54-foot Ted Hood. The fuel management and polishing system was designed and constructed by Nick Jones, one of the senior techs at Bay Shore Marine. Congratulations to George Hazzard and his crew at Wooden Boat Restoration in Millington, MD. 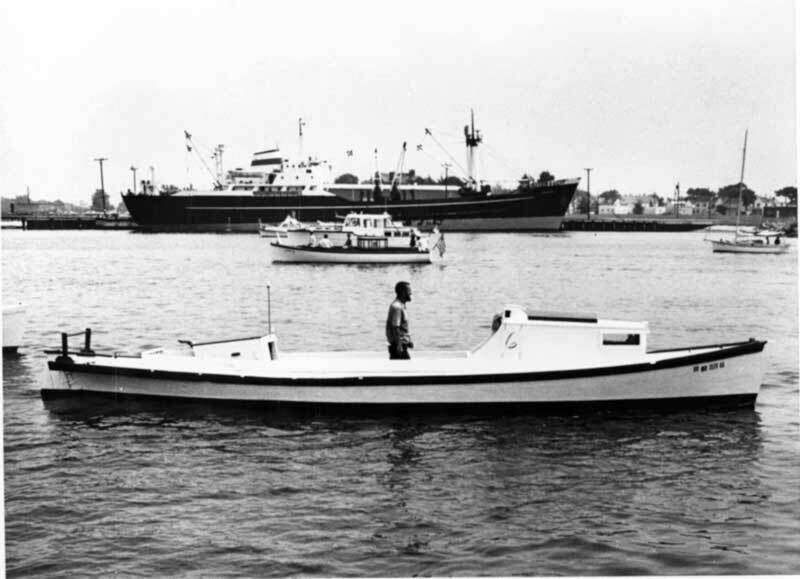 George reports, “Our hard work paid off with the 1958 Sears kit boat that we restored, as it won Best Outboard Boat as well as Best in Show (at the Antique and Classic Boat Festival in June). 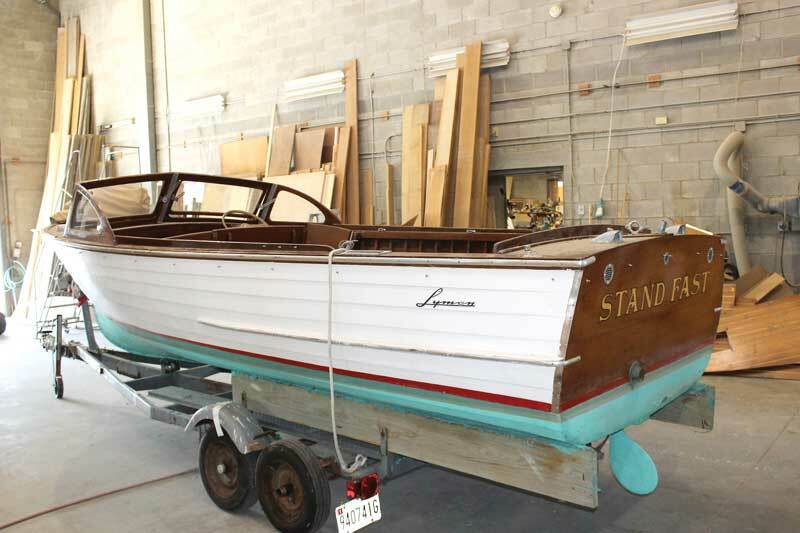 We continue progress on Ralph Cattaneo’s 1949 25-foot Chris-Craft Sportsman. 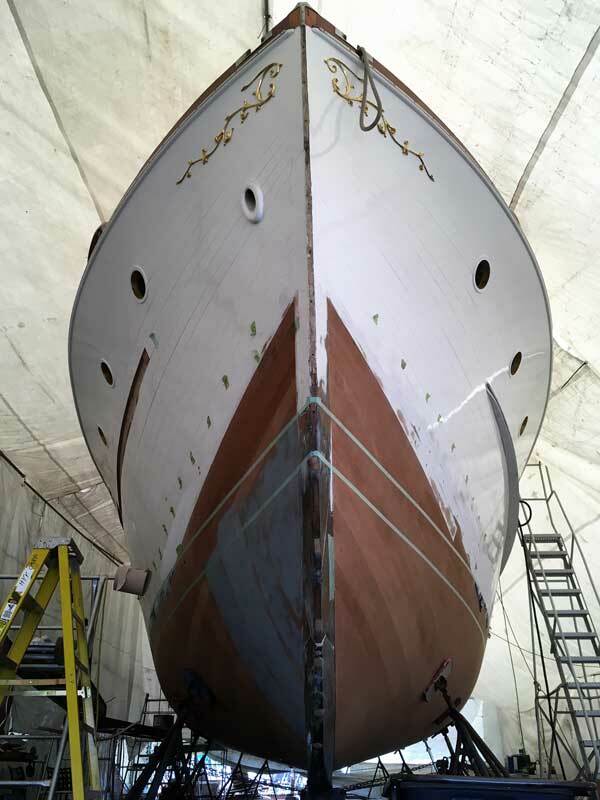 We are also putting on the final coats of varnish on a 1942 17-foot Chris-Craft Runabout." 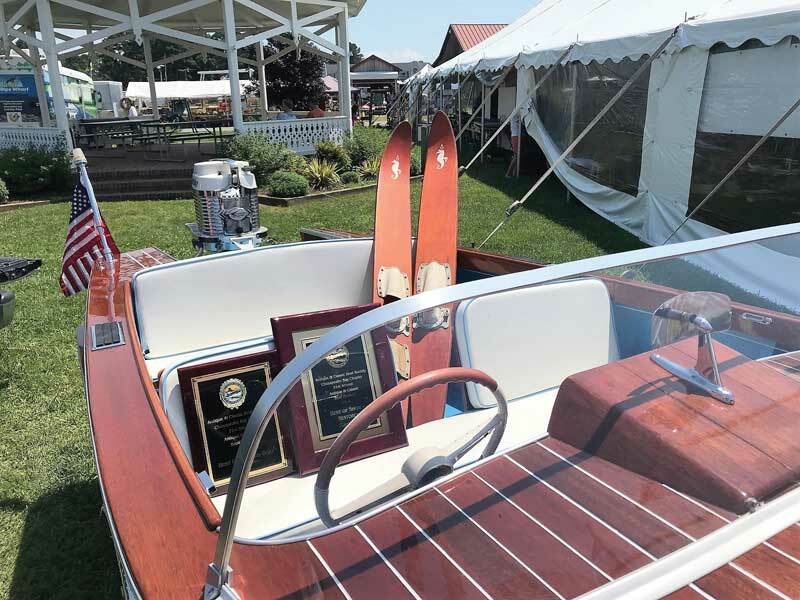 George Hazzard’s Wooden Boat Restoration 1958 Sears kit boat restoration won Best Outboard and Best in Show at the 2018 Antique and Classic Boat Festival. Alex Schlagel from Hartge Yacht Yard in Galesville, MD, checks in: “We are staying busy with normal boatyard tasks such as hauling and launching for surveys, loading and unloading boats on transport trailers, hauling and launching boats with bent props, and hauling and launching for bottom paint. On the Ralph Wiley designed and built Sweet and Low, we installed new engine mounts to replace old hard ones for vibration reduction. To accommodate the new larger mounts, the brackets were modified. While at it, the owner had us clean up and paint the drip pan and anything that needed it. Manatee, a 1955 Trumpy, in the final stages of her bottom replacement at Hartge Yacht Yard in Galesville, MD. An update on the 55-foot Trumpy Manatee: The last planks on the bottom are installed. Pete, Ernie, and Josh spent weeks under the boat sanding the planks fair with belt sanders. The bottom is beautiful, and the guys are buff. How long can you hold a heavy sander steady over your head? Mishandling the sander and digging into the planks would be unforgivable! The perfectly fit sapele planks would look great varnished, but they are now covered with seven coats of Interlux Interprotect 2000E/2001E to get about 15 mils dry. The epoxy prevents the wood from soaking up water or drying and shrinking when hauled and provides a good base for antifouling paint to stick. This bottom is double planked, tightly fit, fastened with screws, and glued with 3M 5200. It shouldn’t absorb much water. Phipps Boat works in Tracys Landing, MD, has taken in a 1959 19-foot Lyman inboard utility boat. The boat requires some repairs and a lot of cosmetic work, but would make an ideal restoration project. The boat still has its original Gray Marine engine. The owner has decided that he does not want to do the work, so if any readers are interested in a project, we know where there is one. The latest report from Composite Yacht in Trappe, MD, reflects a busy time. The new custom CY55 hull mold is being assembled in its satellite facility in Cambridge, MD. At the same time, progress continues on the all-new CY34 Fish Around Express. The CY34 is out of the mold, and the cockpit sole is being fitted to the hull. 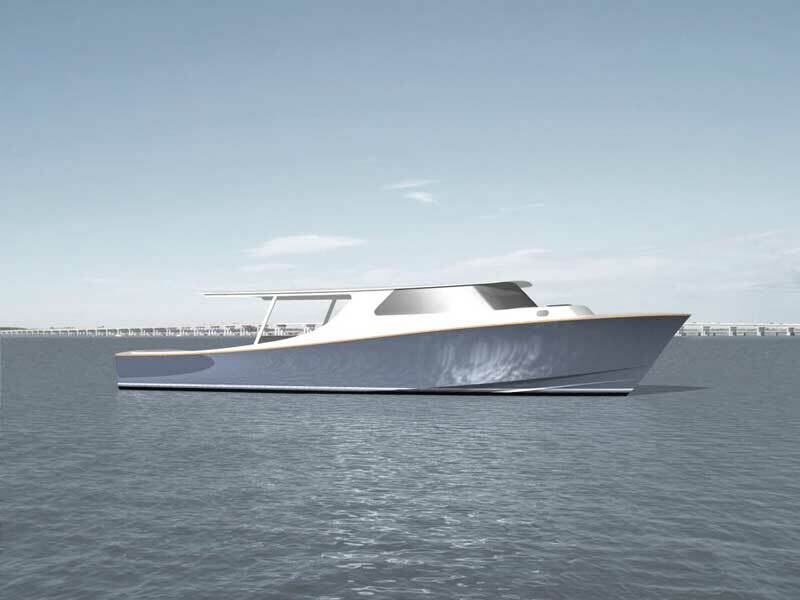 The first rendering of the profile of the Lou Codega-designed, custom CY55 being built by Composite Yacht in Trappe, MD.